Its time to wage war on the betting shops and mini casinos that blight our high streets. 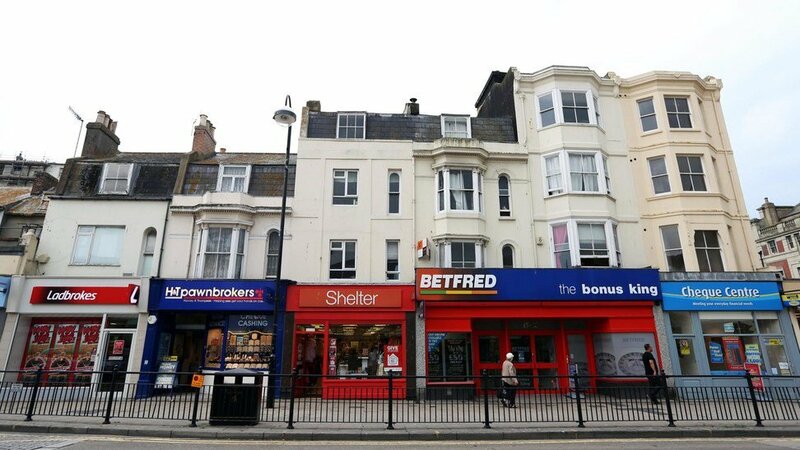 For the past few years I have been including this image in urban design talks that I have been giving and arguing that it was time we either introduce planning legislation that allowed councils to ban betting shops altogether or restrict them to one per square mile. Initially my views were met with some opposition with members of the audience arguing about civil liberties, that I had forgotten about my working-class roots and some arguing about the importance of tax revenues. The tide is changing though and it has been a good while since my view has been shouted down and is now always met with a sea of nodding heads. I don’t countenance the idea that society should derive revenue from a process and industry that can prise money from the vulnerable and more often than not from those that can least afford it. The argument that they help to fill empty shop units and keep our retail districts alive is an empty statement in itself. The pension funds, most private landlords and local authority owners of these shops would all survive without granting leases to gambling companies and by additional planning preventing shops from being left empty for more than, say, six months society would benefit from independent retailers and start-ups being able to get in front of the public and “have a go” like my generation could in the 80s and early 90s. I would much prefer to see a row of shops boarded up rather than be a row of bookies and loan shops because at least that screams “opportunity”. No matter how much gambling firms attempt to promote responsible gambling (is there such a thing and shame on you Ray Winstone) what can be responsible about an industry where it is proven that the higher density of bookies there are in an area, the higher the likelihood of problem gamblers. The Metropolitan Police recently published data showing a 68% rise in violent crime associated with betting shops since 2010. The Gambling Commission in August 2017 published figures showing that there are 430,000 problem gamblers in the UK and addiction is rising. What is responsible about one of the UK’s largest gambling firms 888 allowing more than 7000 people who had chosen to be unsubscribed to access their accounts and gamble (thankfully they have received a £7.8 million fine)? Whilst there doesn’t seem to be any national initiatives in planning circles to restrict the explosion of betting shops (in fact in 2014 the Conservative government led parliament into voting not to restrict betting shops) at least the Labour party are making encouraging noises about gambling by saying that they will ban gambling firms from sponsoring football shirts (a shameful 9 out of 20 Premiership clubs have shirt sponsorship deals with gambling firms). The UK receives about 0.4% of its tax revenue from all forms of gambling so the argument that we can’t afford to clamp down is totally redundant. Lets all start making protestations to our local councils now as there are signs that some councils are starting to understand the issue with 9 London boroughs making plans to restrict a proliferation of bookies in their Local Plan. The horse has bolted (excuse the pun ) but we can make politicians listen if we continue to shout loud.